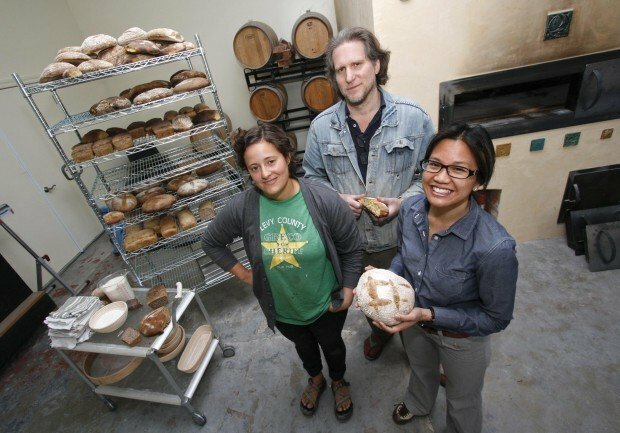 Baker Kate Heller, left, and business partners Peter Pastan and Melissa Sorongon of Piedrassi and New Vineland winery in Lompoc are working together to start New Vineland Bread, a company making a variety of breads using a wood-burning brick oven. Heller adds wood to the fire warming a brick oven Friday at the Predassi and New Vineland winery in Lompoc. The Lompoc Ghetto, known by wine aficionados as a hot spot for good wine, soon will house a business of a different flavor — a commercial bakery founded by the owners of a Ghetto winery. New Vineland Bread is a new project from the team behind New Vineland/Piedrasassi Wines: couples Peter and Amy Pastan, from Washington, D.C., and Melissa Sorongon and Sashi Moorman, both residents of Lompoc. Under his company, September Consulting, managed by Sorongon, Moorman consults for other wineries, including Evening Land Vineyards, Sandhi Wines and Stolpman Vineyards. Peter Pastan is chef and owner of Two Amys Pizzeria and Obelisk, the latter a small but elite eatery near Dupont Circle with “a serious bread program,” he said. 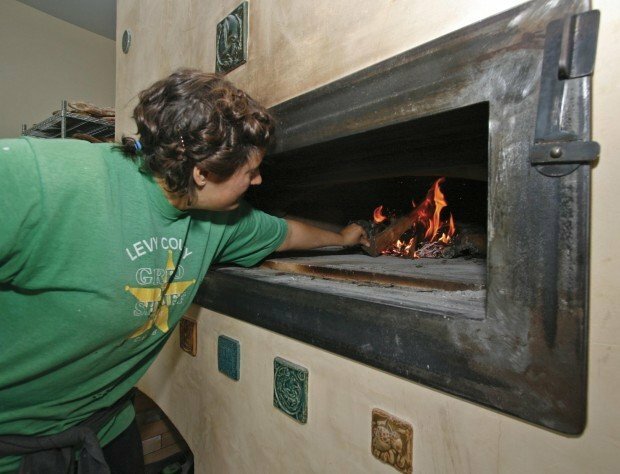 Pastan, New Vineland’s baker, Goleta resident Kate Heller, and Sorongon have in recent weeks put the custom-made, wood-fired oven through its paces, utilizing two hot-burning woods — walnut and trunks from old grapevines — in an effort to “stabilize” it, Pastan said. A stone oven, Sorongon noted, is “very different from a regular, conventional oven — one that you just turn on and it goes straight up” to the required temperature. The oven was hand assembled in about three weeks “from the ground up” with a crew from Vermont’s Turtlerock Masonry Heat, and is made of bricks placed atop “platforms” of concrete. It contains insulation and a stucco finish, she added. “We researched many ovens, and finally decided on one made in a traditional style” — one that best represents the artisan flavor of the company, Sorongon said. The young crew members who assembled the oven inside the bakery, located behind the New Vineland/Piedrasassi Winery’ tasting room on East Chestnut Avenue, attracted curious employees from nearby businesses, she said. While the owners pursue the licensing required of a commercial bakery, Heller spends several hours each day baking loaf after loaf, experimenting with various flours, shapes and sizes. Sorongon said this week that she hopes New Vineland Bread will be able to retail its products by late spring. In the meantime, Heller and Sorongon are “giving away our test breads” to contractors working in the Ghetto and those drawn to the bakery by the pungent odor of freshly baked breads. The owners postponed their initial plan to sell to Santa Barbara County’s Farmers Markets or via various Community Supported Agriculture (CSA) organizations when they learned that vendors must source all their ingredients from within the county, Sorongon explained. Not to be deterred, the couples switched gears and planted their own wheat at two local sites: on property across Ballard Canyon Road from Stolpman Vineyards, and on approximately eight acres of Hayes Ranch, on Sweeney Road. The two properties differ from one another in that the Ballard Canyon Road land is warmer, and the Sweeney Road one cooler, Heller noted. She and the owners anticipate that the first wheat crop will be ready around August. The various types of wheat plants growing will yield berries that will be milled on site and result in durum, spelt, rye, red wing, red fife and sonora flours, Sorongon said. Pastan said he hopes to incorporate fresh pasta into New Vineland Bread’s product lineup. The owners are delighted at being able to incorporate “as much ‘local’ as we can” into the bread company, Pastan said. He showed visitors buckets of spent barley from “Hoppy Poppy IPA,” made by Buellton’s Figueroa Mountain Brewery, and noted that the breads also contain walnuts sourced from a local orchard and local olive oils. Freelance writer Laurie Jervis can be reached at winecountrywriter@gmail.com.